Mike L. is a retired aerospace engineer who lives in the Los Angeles area. He built his own home and currently owns and operates a home remodeling business. He has been actively engaged in high performance audio/video since the early 1970s and is an active member of AVS forum. Mike wanted to build an addition onto his home for a dedicated home theater. 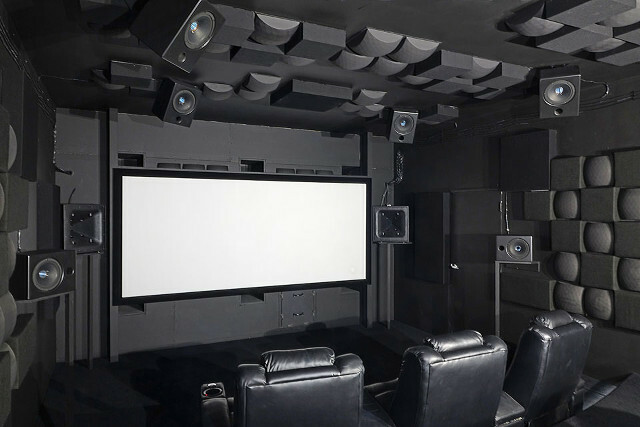 He engaged with a number of subject matter experts to make his dream come true, including Acoustic Frontiers for the home theater acoustic treatment design. The home theater included a number of highly effective but rarely used design elements, including a single bass array (SBA) for the low frequencies, a 3ft absorptive back wall and an all point source speaker array. Electronics included a 16 channel Trinnov Altitude 32. Starting from a 3D CAD model of the room and speaker dispersion characteristics, we planned out a home theater acoustic treatment design that would deliver reference class results. Acoustic treatment design for the theater ceiling. Additional drawings were provided for all walls. 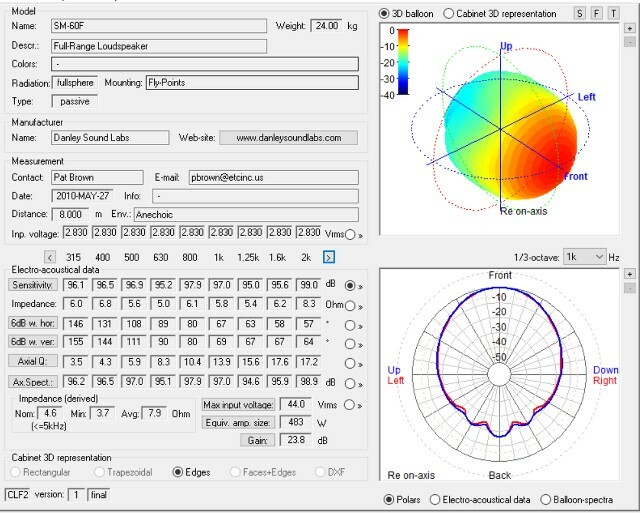 Our approach to acoustic treatment design is to a) ensure room mode resonances are controlled and b) manage the energy in the early reflected field. See our blog article Early Reflections 101 for more on our approach to this area of home theater acoustics. In a modern multi-channel home theater, with 8 or more surround speakers, there are many, many reflection points. Each speaker and seat combination will have a primary (first) reflection point on the ceiling, floor, side walls and front/back. The question is therefore how to deal with all these reflections. A lot of these reflections are at high off axis angles, and many involve long reflected path lengths. Our approach to managing the energy in the early reflected field is based on an understanding of psychoacoustics (how humans perceive sound). We use ray tracing to identify reflection points and consider speaker dispersion and level / delay / direction of reflected sound in our analysis. Reflections from left / center / right speakers are treated differently than reflections from the surround speakers. With the surround speakers we aim to create a uniform acoustic environment such that spatial audio sound effects in Dolby Atmos and DTS.X track seamlessly from a sound localization perspective and do not exhibit timbral change as they move throughout 3D space. The resulting acoustic treatment design includes a number of custom absorbers with tapered high frequency absorption, as well as checquerboard absorption / diffusion arrays using the Auralex Geofusor in order to create a uniform reflected field for the surround speakers. The client desired a form follows function home theater acoustic treatment design, and we certainly delivered that! 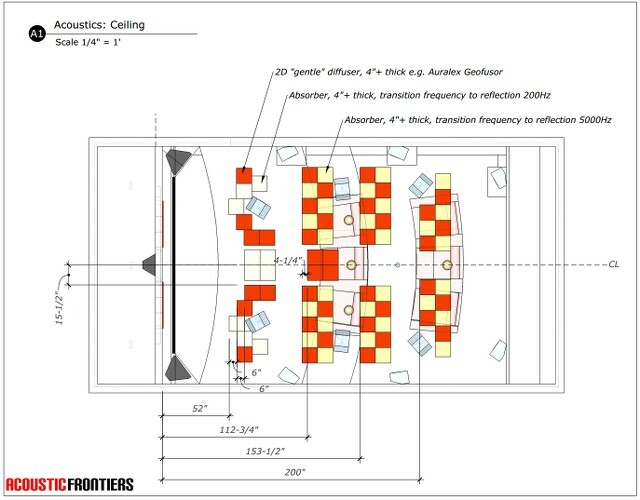 Reference class acoustic treatment design. “I consider the home theater acoustic treatment design performed by Acoustic Frontiers to be one of the most value added things I did for the build. Hearing the room change as I added the treatments was a revelation. The walls just seem to disappear. He was able to take into account the single-bass array and additional criteria of my project without being overly prescriptive. I am glad I did not try to tackle this on my own and highly recommend his services.” Mike L., Los Angeles, USA. I was lucky enough to see and experience his theater in person and I have to say I absolutely fell in love with the design and the sound. So incredible, talking about feeling that bass hit you right in the chest. The opening sequence for Blade Runner 2049 was intense!!! 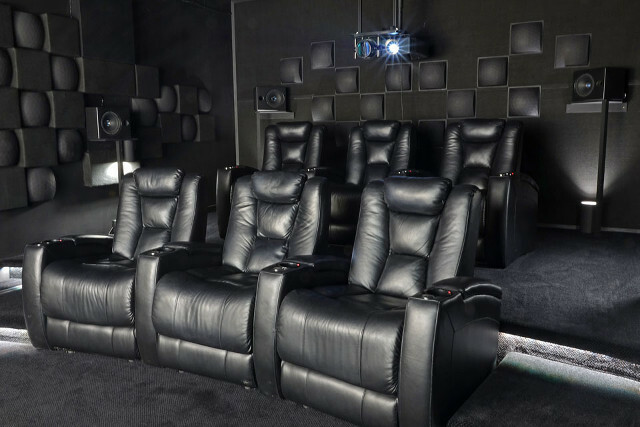 It made me rethink my home theater design entirely and plan to do something very similar. Simply awesome!!! !